La Blanca "Paradise Passport" coverup tunic. Caroline Rose tunic in soft stretch-velvet. Boat neckline. Three-quarter sleeves; cold shoulders. Side slits at hem for ease of fit. Caroline Rose tunic in soft stretch-velvet. Boat neckline. Three-quarter sleeves; cold shoulders. Side slits at hem for ease of fit. Pullover style. Polyester/spandex. Unlined. Dry clean. Made in USA of imported material. Model's measurements: Height 5'10"/177cm, bust 33"/84cm, waist 25.6"/65.2cm, hips 35.8"/91cm, dress size US 2-4/FR 34-36. 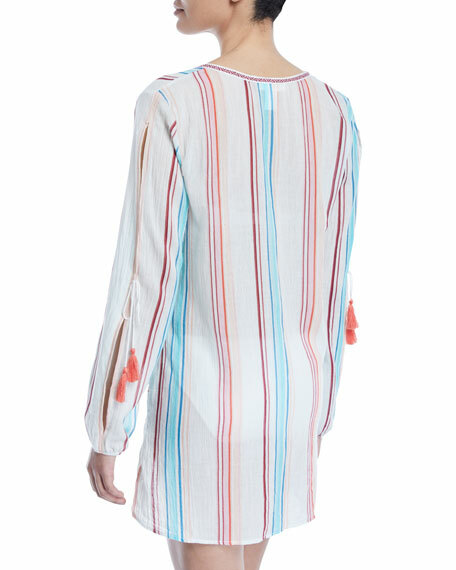 Joan Vass tunic in striped cotton interlock knit, featuring zippered pockets with contrast piping. Approx. 32"L down center back. Graceful boat neckline. Three-quarter sleeves. Pullover style. Cotton. Machine wash. Imported. Model's measurements: Height 5'10"/177cm, bust 33"/84cm, waist 25.6"/65.2cm, hips 35.8"/91cm, dress size US 2-4/FR 34-36. EXCLUSIVELY AT NEIMAN MARCUS Johnny Was easy-fitting tunic in embroidered velvet. Banded collar; placket front. Long sleeves. Silk. Rayon lining.